I woke up this morning to drizzling rain and chill in the air. Despite the occasional tomatoes showing up in the market, it is autumn in Ontario with the changing colour of leaves and bountiful harvest. This is definitely my favourite season not just because I’m an autumn baby (yup, today is the day!). Many of my favourite food are at their best this time of year, most notably pumpkin and winter squash. I used to feel pretty sheepish about opening a can of pumpkin puree for my cooking and baking needs. Last year, I finally tried my hands on roasting whole pie pumpkins to make my own puree from scratch. To be honest, the result was underwhelming. Some pumpkins were sweet while others were disappointingly bland. The amount of work to dry out the puree to a workable consistency was just too much work for inconsistent result. The bright side is I don’t feel bad about using canned pumpkins anymore. 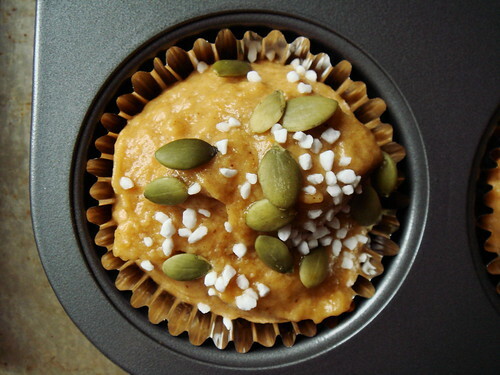 To mark the arrival of autumn and all things sweet, warm, and spicy, I made a batch of pumpkin spice muffins this morning. 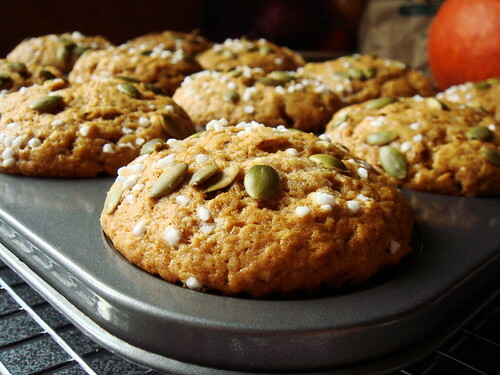 The taste is delicate so the flavour of pumpkin comes through with complementing cinnamon, cloves, ginger, and a bit of molasses. The best part though is the superbly light and tender texture. 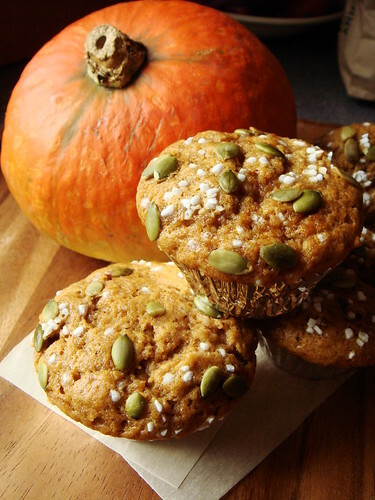 Unlike most muffins, there is nothing “rustic” about it. The secret lies in an unexpected ingredient. I adapted the recipe from Joanne Chang’s Flour: Spectacular Recipes from Boston's Flour Bakery + Cafe. I thought I had all the ingredients called for in the recipe until I realized I was out of orange juice. I can imagine the tang and sweetness of orange can really highlight the earthy pumpkin taste. But! I was not about to walk to the grocery store next door in my pyjama so a bit of creativity was necessary. I surveyed my fridge and pantry. Milk? Buttermilk? Almond milk? The extra richness from dairy is probably not necessary. Lemon juice? Too harsh. Water? I don’t need to dilute the already delicate flavour. Then I spotted the 6-pack of Mill St Brewery Coffee Porter. I bought these on a whim to share with Boyfriend even though I am not much of a beer drinker. I love their robust coffee taste so I decided to give them a try in the muffin recipe. The bit of fizz from the beer gave the batter some extra lift to create the lightest crumb. The slight bitterness and intense coffee flavour added depth to the autumnal flavour profile. Now that’s what I call a happy coincidence! Preheat oven to 350F. Line a 12-cup standard muffin tin with paper liner. In a large mixing bowl, whisk together flour, baking powder, baking soda, salt, cinnamon, cloves, and ginger. Set aside. Using the paddle attachment of a standmixer, cream butter, sugar, and molasses for 2 – 3 minutes at medium speed until fluffy. Turn the speed to low and mix in eggs one by one, ensuring each is fully incorporated before adding the next. Scrap the side and bottom of the mixing bowl to make sure everything mixes evenly. Still on low speed, mix in beer and pumpkin puree until you have a homogenous batter. It may appear curdle but it’s okay. Pour flour mixture into the batter and mix on low speed just until combined. Do not over mix. Divide the batter among the muffin tin. I use a 1/4 cup ice-cream scoop and it is the perfect size. 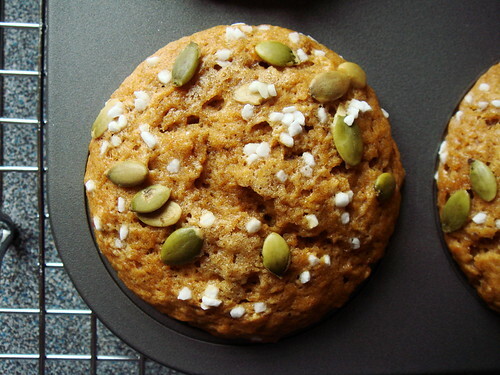 Top with pumpkin seeds and pearl sugar. Bake for 25 – 30 minutes or until top is golden and cake tester comes out clean. Cool the entire pan on rack for 5 minutes before unmolding. 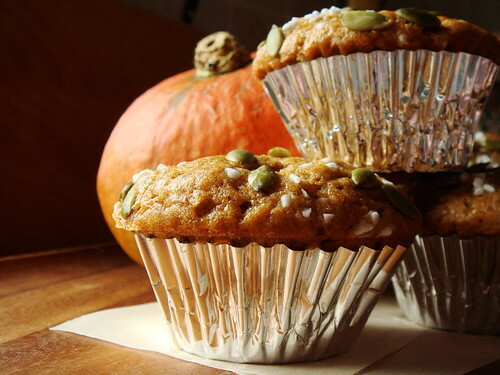 The muffins are best enjoyed warm out of the oven but they are good the rest of the day too.